“The Hershey Theatre is located in downtown Hershey, PA, and has established itself as the area’s premier performing arts center. We present the finest in touring Broadway shows, classical music and dance attractions, and world-renowned entertainers. It is safe to say that since we present the best, we expect the best. 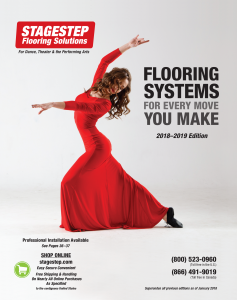 In the spring of 2008, we purchased Super Bravo C Marley flooring from Stagestep-Aeson Inc. With multiple dance recitals, professional dance companies, and first-class events gracing our stage, our standard of product to serve as a dance floor is top notch. The staff and sales representative at Stagestep-Aeson were professional, informative, and prompt in assisting us to find the product style that would best suit our performance needs. They understood our requirements and went above and beyond to assure that we would be pleased with the floor. The floor has sustained thousands of leaps, millions of taps, and is still in remarkably good condition for the number of times it has been rolled and unrolled. In the Summer of 2011 when four of the pieces were damaged by a visiting company, the staff at Stagestep-Aeson once again stepped to the plate by helping us replace the damaged pieces in a timely fashion.